Braking capability is every bit as important as power delivery and at Scoobyworld we're experienced in all aspects of brake upgrades and replacements. From a simple disc and pad replacement to full 6 or 8 pot caliper conversion we're able to cater for all your needs. Prices shown above are for labour only, for prices of parts please use the product links on left. Call us on 01509 266 400 to book in, for more information or to discuss your requirements. Scoobyworld is an authorised stockist of the Exedy, RTS and Competition Clutch ranges of fast road clutches, from the standard stage 1 organic clutch to the high performance twin plate variations for the more powerful cars. Prices shown above are for labour only (unless stated), for prices of parts please use the product links on left. One of the first upgrades our customers look for - the performance exhaust system. Providing more power and a sportier, rally-esq note to the car, all our exhausts are manufactured in T304 grade stainless steel and designed to fit first time every time. From full exhaust systems with fast flow sports cats to standard replacement sections or full race exhaust systems we're able to supply and install to your exacting requirements, alongside the ability to have completely custom systems fabricated if required. From lowering springs to full coilover setups we're able to provide all your suspension upgrade requirements from supply only to supply, install and setup. 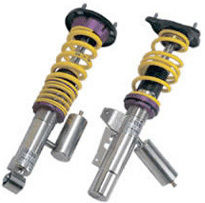 Our lowering springs from both Eibach and Tein lower the ride by around 25-30mm, whilst our full coilover kits from the likes of KW, and D2 provide a complete strut and spring replacement with variable ride height as well as other settings. Scoobyworld is an authorised stockist of the following brands Tein, KW, Eibach, D2 and BC. Prices shown above are for labour only unless stated. For prices of parts please use the product links on left. Whether you're looking for a full set of gauges supplied and installed or a single boost gauge in a pillar pod, we can cater for all your requirements. 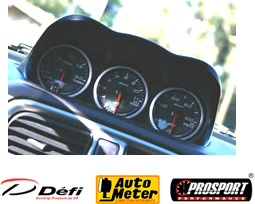 We stock a range of gauges from Prosport, Autometer, HKS and Blitz along with custom pods. Fitting for a full set of gauges generally takes around 4 hours to complete and we're happy to spend time talking you through features of your new gauges if necessary. Popular gauge installs include the our Prosport gauges, in a 3 gauge centre pod, including oil temperature, oil pressure and boost pressure. 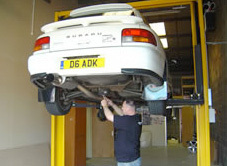 At Scoobyworld we're setup to cover all aspects of Subaru repair or installation, from a full set of mudflaps to a 255lph fuel pump, turbo timer installation to full engine diagnostics (2001 onwards). So whatever your Subaru needs, why not give us a call or pop in and see us for a chat.